I have put together a compendium of the most virulent myths to come out of the Vietnam War. Some of these myths, because they have been repeated so many times, and have been showcased in some deplorable books and movies about the war, have taken on the status of "fact" in the minds of an alarming number of people. While some of these myths can be exposed as apocryphal tales by examining the statistics compiled during and after the war by independent sources, others are impossible to disprove. You can not "prove" a negative hypothesis. All that one can do is examine the evidence and determine if there is any susbstance to the allegations. Statistical data was obtained from analysis of the Combat Area Casualty File of 11/93 (CACF1193), and The Adjutant General's Center (TAGCEN) file of 1981. Additional sources for factual data are listed below in the bibliography. The 1968 Tet offensive was a total and complete miltary disaster for the North Vietnamese Communists no matter how you look at it. If you measure victory by territory gained or enemy killed, the North Vietnamese Army and the Viet Cong failed dismally in their attacks. The NVA and VC had counted on a "People's Uprising" to carry them to victory, however there was no such uprising. They did exactly what the American military wanted them to do. They massed in large formations that were incredibly vulnerable to the awesome fire support the U.S. Military was able to bring to bear on them in a coordinated and devastating manner. The NVA and VC attacked only ARVN installations with the exception of the US Embassy in Saigon. Despite reports to the contrary by all major television news networks and the print media, the VC sapper team of 15 men never entered the chancery building and all 15 VC were dead within 6 hours of the attack. They caused no damage to any property and managed to kill 4 US Army MPs, and one Marine guard. The South Vietnamese Police tasked with guarding the Embassy fled at the first sound of gunfire. The NVA/VC launched major attacks on Saigon, Hue, Quang Tri City, Da Nang, Nha Trang, Qui Nhon, Kontum City, Ban Me Thout, My Tho, Can Tho, and Ben Tre. With the exception of the old imperial city of Hue, the NVA/VC were forced to retreat within 24 hours of the beginning of the offensive. In the process they suffered devastating losses among the southern VC cadres. Using the southern VC as the spearhead of these attacks was an intentional device on the part of the North Vietnamese politcal leadership. They did not want to share power with the southerners after the war, so they sent them out to what was inevitable slaughter. The NVA mainforce battalions were held in "reserve" according to Vo Nguyen Giap, in order to "exploit any breakthroughs". In the first week of the attack the NVA/VC lost 32,204 confirmed killed, and 5,803 captured. US losses were 1,015 KHA, while ARVN losses were 2,819 killed. ARVN losses were higher because the NVA/VC, reluctant to enter into a set-piece battle with US forces, attacked targets defended almost exclusively by South Vietnamese troops. Casualties among the people whom the NVA/VC claimed to be "liberating" were in excess of 7,000, with an additional 5,000 tortured and murdered by the NVA/VC in Hue and elsewhere. In Hue alone, allied forces discovered over 2,800 burial sites containing the mutilated bodies of local Vietnamese teachers, doctors, and political leaders. Only the news media seemed to believe that in some way the Communists had achieved a "victory". To put this in perspective, the news media would have reported the Battle of the Bulge, Hitler's last ditch attempt to stop the allied forces in Europe, as a "disaster" for the Allies. They would have said that "despite Allied efforts, the enemy still has the means to mount a major offensive, and therefore the war in Europe is unwinable". Sound goofy? Well, that is exactly what Walter Cronkite said on national TV after the 1968 Tet offensive. He did not say this in WWII, mostly because the news media operated under strict war time secrecy laws that discouraged any negative reporting. For example, in WWII it was expressly forbidden to show the bodies of dead American soldiers in any newsreel footage or photograph. Any photos or film that did so were simply confiscated by military censors. When was the last time you saw a history book that had photos of dead GIs? Find a newspaper photo in the New York Times morgue that depicts a dead American soldier in WWII. Would there have been pressure on the home front to end our involvement in WWII had the media been permitted to show live pictures of GIs who had lost both legs to a German mine? Or photos of the thousands of Marines who were dying to capture islands no one could even find on a map? Islands which we gave back after the war. In Vietnam however the media operated under no such restrictions and were free to go wherever they wanted and film and photograph whatever they wanted. Despite this the overwhelming majority of the media never left the comfort of Saigon. The film clips of Morley Safer, Charles Kuralt, and others which seem to depict raging firefights in the background are very likely staged events. If you look closely at these film clips you will notice that the people in the background are acting rather nonchalant for people in a firefight. Only the reporter seems to be crouching low to avoid being "hit". Keep in mind that by carefully composing a scene, a camerman can make a small crowd of people look like a mob of thousands. So too can a couple of people firing M-16s be made to appear as if a firefight is in progress. Of all the men and women who served in Vietnam, 275,000, or 10.6%, were black. The remaining 88.4% were Caucasian. At the time of the Vietnam War, Blacks represented approximately 12.5% of the total U.S. population. There is a persistent myth that Blacks were used as "cannon fodder", being assigned to infantry units where they were forced to "walk point". This is not supported by the casualty data which indicates that 86.8% of those killed in action were Caucasian, while 12.1%, or 5,711, were Black. Again, this number is approximately the same as the percentage of Blacks in the general population during the war. It appears as if this myth was generated by the anti-war movement in an effort to bolster their ranks by convincing Blacks (who could hardly be losing sleep over the fact that some white college students might have their education interrupted by military service) that they were being used as pawns to be sacrificed. Only 25% of those who actually served on the ground in Vietnam were drafted. The remaining 75% volunteered for the Army, Marines, Air Force, Navy, and Coast Guard. Less than 38% of those killed in action were draftees. So contrary to the myth popular at the time, being drafted during the Vietnam War Era was not a "death sentence". The Vietnam War lasted for over 10 years. During that period 58,202 Americans lost their lives in an attempt to preserve the sovereignty of the Republic of Vietnam. Much has been made of drug use among personnel in Vietnam. What is ironic is that the overwhelming percentage of American drug users were civilians, and a very high percentage of anti-war activists were drug users. The number of drug-related arrests by Military Police officers and CID agents during the war actually represents a much smaller percentage of drug use among the military than in the overall civilian population during the Vietnam War. Further, drug use in Vietnam was confined almost exclusively to personnel stationed at base camps and other relatively secure installations. These people had free time and the ability to go out on the local economy and buy drugs. Drug use in the field was rare and was discouraged even by personnel who used drugs in the rear. The reasoning was fairly straightforward: drug use in the field endangered lives. It was not a "victimless crime" in the field. Also, for people who were in the remote areas, such as the Central Highlands, there were few Vietnamese civilians to purchase drugs from. Peer pressure was usually enough to discourage drug use when in the field. Those who were stupid enough to use drugs in the field were often beaten senseless by their non-drug-using comrades. Those that persisted were usually killed in action, sometimes by hostile fire, and occasionally, tragically, by friendly fire. The term "fragging" was coined for the intentional murder of a superior officer or non-commissioned officer since a fragmentation hand grenade, or "frag", was the weapon used in some of these incidents. Given the total number of these incidents (230) over the 10-plus years of American involement, from a percentage standpoint you were far less likely to be a homicide victim in Vietnam than on the streets of Berkeley, California. Given that everyone who was in-country from the spring of 1969 to 1972 was keenly aware that U.S. troops were being withdrawn from Vietnam, it is nothing short of a miracle that morale remained as good as it did (which wasn't very) during this period. It was precisely during this period that the overwhelming majority of homicides occurred. But it must be taken into account that the soldiers who were sent to Vietnam during this period, especially the draftees, had been bombarded for years by the anti-war movement and were more inclined to question authority, especially military authority. It was also no help to good order and discipline when judges started giving convicted criminals the choice of jail or the Army. You can be assured that even an understrength rifle platoon would have preferred to remain understrength than to be given sociopaths as replacements. This misguided policy on the part of state judiciary systems was part of the reason that discipline began to erode from about 1970 onwards. A good number of the intentional homicides committed during this period were perpetrated by these sociopaths. Finally, it must be understood that intentional homicides, especially of superior officers and non-commissioned officers, have occurred in every war in history. This includes Americans in WWII and Korea. Everyone who served in Vietnam at some point heard the story of a VC captive being hurled from the open door of a Huey in flight. According to the story, the hapless VC was tossed out to scare the other VC in the Huey into "talking". Variants of this story have the hapless VC thrown out with a rope around his neck, the other end of the rope tied to one of the Huey's skids. One hears this story so much that you have to wonder if any helicopters were used for anything other than dropping live VC captives from great heights. And it is a mystery as to what, exactly, anyone would have done with a captive who wanted to "talk" because almost no one spoke Vietnamese, an extremely difficult language to learn and pronounce. Because Vietnamese relies a great deal on tonal inflection, it is entirely possible to inadvertently insult someone while trying to ask a straightforward question. So given this, what was anyone going to do, exactly, with a VC captive who was blabbing his head off? This story seems to have grown a big tail from what was probably its actual roots. I for one witnessed a NVA or VC body dropped from a Huey. It occurred on September 25th, 1968 at BR829594 in the Suoi Ca Valley. A Dustoff chopper radioed us that they were dropping off a dead PW who they had been transporting to a hospital and who had died enroute of a massive abdominal wound. They requested we bury the body. When they arrived at our position, the chopper hovered about ten feet off the ground and the medic and crew chief began lowering the body from the door. In the process, the body slipped from their grasp and fell the ten feet to the ground. It was clearly a dead body. There is no mistaking a dead body. This one had a battle dressing covering a huge wound to the abdomen. We buried the man right where they dropped him. Others, who were further away from the spot where the chopper hovered, thought he had been tossed--alive--from the Huey. Sure enough, a month later I overheard one of these guys regaling a Base-Camp-Commando with the story of a "live" VC being "tossed" from the Huey. And the Base Camp Commando was told that the VC had been tossed out from "about 500 feet". As this guy repeated this story, the Huey became progressively higher and higher, until it was almost in Earth orbit. The majority of these stories seem to originate with men who had rear-echelon jobs. Upon returning to the United States, they felt compelled to embellish their war time service. After all, when someone asks "What did you do in the war, Daddy?" it's not very attention grabbing to respond "I was a cargo handler at the aerial port of Cam Ranh Bay". I have met more men who claim to have been Green Berets in Vietnam, than there were Green Berets in the entire Army. The same goes for people claiming to have been Navy Seals, or Marine Recon. Some just don't want to admit that they were in a non-combat job. So they "embellish". And part of the embellishment involves repeating the myths that they have heard, and embellishing them as well. Then there are those pathetic souls who never served in Vietnam, but claim that they did. They tell the wildest, most unbelievable stories imaginable, which usually make it into the next "Rambo" movie plot. Which of course, makes it a "fact". On a final note, I can just imagine assigning this duty to someone. ME: "Jones, it's your turn to throw hapless VC prisoners from a Huey". JONES: "Awww, sarge, I threw hapless VC prisoners from Hueys all day yesterday. It's somebody else's turn!" If they were they were covered up with extraordinary skill and precision. Only two documented cases of War Crimes can be attributed to American Military personnel. One was the senseless slaughter of civilians in March 1968 at the village of My Lai by the 1st platoon of Charlie Company, 1st Battalion 20th Infantry, 11th Light Infantry Brigade, 23rd Infantry Division (Americal). The other was the murder of 16 noncombatant women and children by five U.S. Marines of Bravo Company, 1st Battalion, 7th Marines, 1st Marine Division, at a village named Son Thang-4, southwest of Danang, on 19 February 1970. In both cases there was a court martial, and in both cases the accused were found guilty. In the case of Lt. William Calley, President Nixon stepped in and pardoned him after he had spent three years under house arrest. Why Nixon did this is unknown, but it is beyond belief that he would do such a thing. For the end result is a slap in the face to every Vietnam Veteran who did their job and served with honor by adhering to the Rules of Land Warfare of the 1949 Geneva Convention which set the rules of engagement and expressly forbid the type of behavior exhibited by Calley and the thugs he commanded. They were not soldiers. They were thugs. But while these egregious crimes have been trotted out at every opportunity by the anti-war movement, very little attention was paid to the horrendous atrocities committed by the North Vietnamese Army and the Viet Cong on their own people. One of the end results of the 1968 Tet offensive was the deliberate roundup and murder of as many as 5,000 South Vietnamese civilians--doctors, teachers, lawyers, businessmen--by the NVA/VC during the periods that they held territory. The most widespread atrocities occurred in the Imperial city of Hue. There alone the Communists killed over 3,000 South Vietnamese. This behavior was not widely reported by the press, and either ignored by the anti-war movement at best, or justified by them as necessary in a socialist revolution. 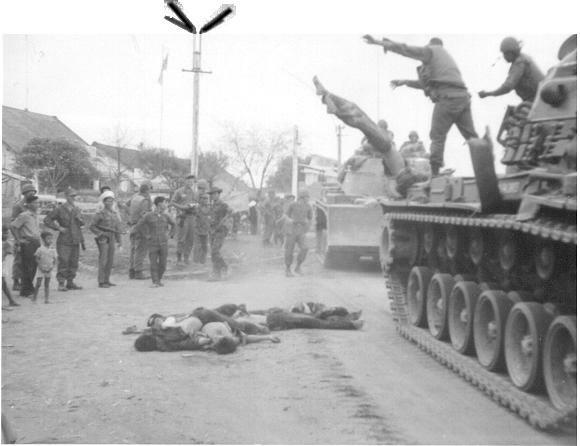 Additionally, not much of a fuss has been made over the intentional murder of American civilians (including missionaries and USAID workers) captured and murdered by the North Vietnamese. U.S. POWs did not fair any better. Those that were not murdered were systematically tortured by the North Vietnamese. Although these atrocities qualify as war crimes under the Geneva Convention, the lunatic fringe of the radical left condones those acts as "justifiable". This is another one of those enduring myths that actually had its roots with the South Vietnamese Army. During the period when Americans were strictly advisors to the ARVN (Army of the Republic of Vietnam) the South Vietnamese were courting favor with the Kennedy Administration. In order to make it appear that they were doing more to fight the insurgents then they were actually doing, and therefore be eligible for more military assistance, they faked the number of VC they claimed to have killed in most operations. Reporters covering the war from Saigon assumed that the Americans would do the same thing and that is basically what they reported. They took the position that any casualty estimate, or as they put it, body count, must be inflated. Personally, I never heard the term "body count" until I returned to the United States after my tour. They were called "enemy casualtiy reports" in Vietnam just as they were in Germany. In actuality, every enemy casualtiy report made by every unit I was attached to had to be verified by a senior officer before it was accepted. More than once we had to haul dead NVA/VC out from remote battlesites on the back decks of our tanks to a place where a battalion or brigade officer could see them in person before they were counted. On several occasions my crew and I, along with an infantry rifle squad, sat in the sun babysitting bloated corpses until they could be officially counted. Only then did we get the unpleasant job of burying the bodies. The NVA and VC took great pains to remove their dead from the battalefield in order to conceal their true losses. More than once we found wooden "body hooks" the NVA used to haul their dead from the field of battle. This led to a practice of adding estimates of the number of "probables" (i.e., "probably killed, no body recovered") to the count of "confirmed" killed. While it is certainly possible that some commanders choose to report the sum of these two numbers rather than separate figures, I doubt whether this was a systemic practice based on personal experience. There was a standard formula for estimating enemy wounded, based on statistics gathered from World Wars One and Two that basically said that two men were wounded for every one killed. The irony of this whole affair is that on April 3rd, 1995, on the 20th anniversary of the end of the Second Indochina War, the North Vietnamese Communists finally admited their true casualties. While the U.S. Command had officially stated that we killed about 750,000 NVA and VC, the Communists declared, in an official press release to Agence France, that we had actually killed 1.1 million NVA soldiers. There are a large number of people who believe, based on "live sighting" reports as well as satellite imagery which appear to show "evader signals", that North Vietnam and Laos still hold live American POWs. I wish this were true but the avilable evidence does not support this belief. If the North Vietnamese did withold American POWs in 1973, then they are long dead. Consider that while it is possible that the North Vietnamese could have witheld Americans as a possible "bargaining chip" in the event that the U.S. violated the terms of the Paris Peace Treaty (the U.S. did not, the North Vietnamese did), what could they possibly have done with them after 1975? They could not very well announce to the world what they had done. Even Communists propagandists would have been hard pressed to explain the sudden appearance of six hundred-plus Americans who they had repeatedly denied existed. If the North Vietmamese and Pathet Lao forces did withold Americans, they have long since starved them to death or murdered them outright in order to cover up their deceit. It defies belief that the North Vietnamese would risk international condemnation (as weak and ambivalent as that would have been) by keeping these people alive. Since they were listed in most cases by U.S. Forces as "Missing, presumed killed", all the North Vietnamese had to do was simply remain silent and murder them. Then they were "killed in action". It is far more likely that the overwhelming majority of the Americans listed as MIA today were intentionally murdered by North Vietnamese and Pathet Lao forces soon after their capture. After Action Reports of SOG teams who made insertions into Laos indicate that Americans who were taken prisoner were usually gratuitously tortured and then murdered soon after their capture by local commanders. Many who were captured alive were subsequently murdered by VC and NVA forces in the process of being marched to POW camps in Laos and North Vietnam. A good example is the case of an American missionary working at the Leprosarium in Ban Me Thout. Betty Olson was murdered by her North Vietnamese captors after she became ill from Dengue Fever. She received no medical treatment from her captors, and when she became too weak to walk they shot her. This was apparently routine treatment by people who Jane Fonda and Tom Hayden refer to as "heroic freedom fighters". There is also a certain percentage of Americans downed in Laos who probably successfully evaded capture only to die of starvation or exposure in the wild jungles of eastern Laos. If you have never been to the mountainous Central Highlands area of South Vietnam, which extend westward into Laos, you have no appreciation as to just how wild and trackless the area is. It can, and did, hid divisions of troops. It is not hard to imagine downed pilots and SOG personnel wandering around in this wilderness unseen by friend and foe alike. What is a sham is the North Vietnamese effort to help locate and return the remains of Americans listed as MIA. Totalitarian governments such as North Vietnam's record everything in minute detail. I believe that they have recorded the location of every single American aircraft lost over land in Southeast Asia during the war. I also believe that they have detailed records as to the fates of the crews and passengers aboard these aircraft.